For her doctoral research, Hannah joined Jon Essex’s group at Southampton. Here she harnessed the experience of colleagues specialising in the development and application of computer simulation in the field of organic and biological molecules, and molecular association in particular. 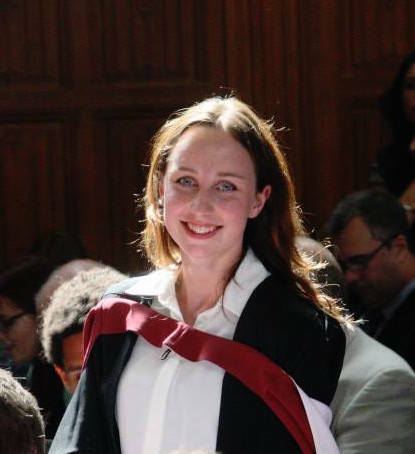 Hannah’s PhD set out to shed new light on the way that drug molecules interact and bind with water molecules in proteins – a process vital to the effectiveness of many drugs – by developing and applying grand canonical Monte Carlo methods to enhance the sampling of water in protein-ligand free energy calculations. Actively involved in the many group activities undertaken by members of TMCS, Hannah was a member of the team which presented the TMCS ChemGolf game at the Cheltenham Science Festival, and on behalf of her TMCS cohort accepted the 2016 prize for Innovation and Development at the annual Southampton Roadshow awards. She also acts as a buddy for year-1 students, welcoming them to TMCS and helping them settle in.